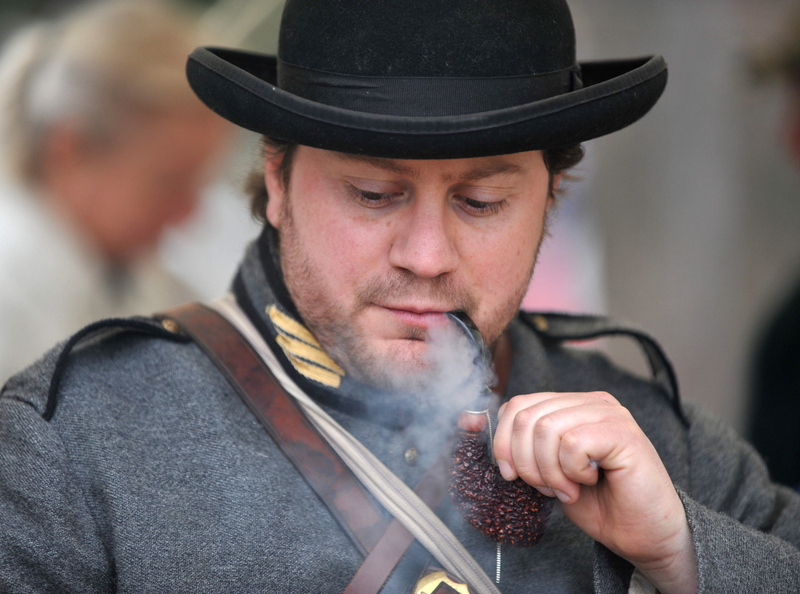 Civil war re-enactors brought a piece of history to life Saturday at Abbott Park. FARMINGTON — A jogger on Prescott Street glanced over with only a hint of worry as seven men in nearby Abbott Park fired antique rifles in her general direction Saturday, releasing a cloud of smoke that gave off the acrid smell of burnt gunpowder. Her instinct, that the men, who were wearing Confederate military outfits from the historic Civil War, posed no threat, was correct. 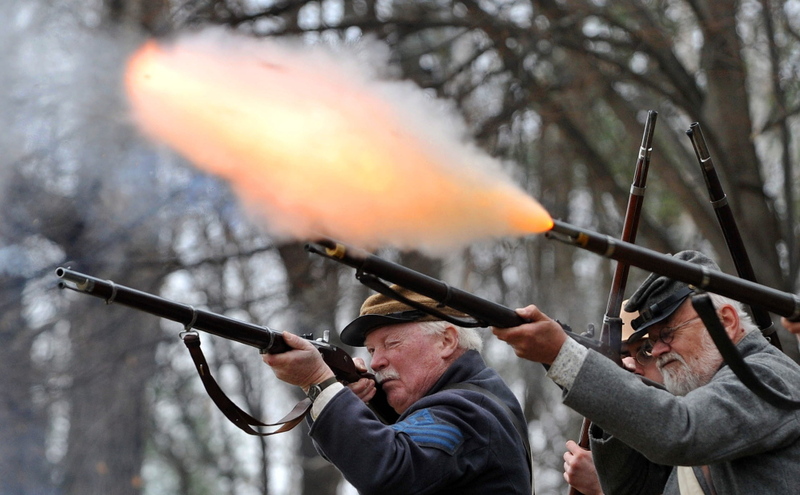 They were Civil War re-enactors, a group that has gained more enthusiasts in recent years, as the 150th anniversary of each of the conflict’s many battles rolls around. 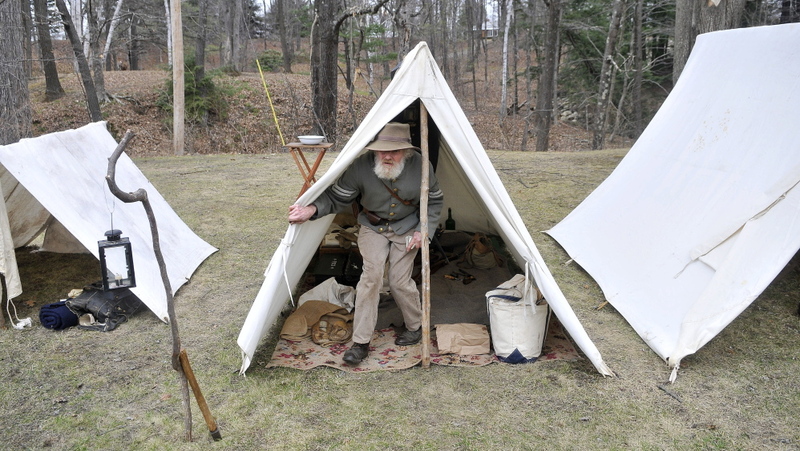 About 20 re-enactors, some from a newly formed Civil War Club at the University of Maine at Farmington, came together on Friday night, pitching canvas A-frame tents, drinking from tin cups around a campfire and talking about the war before falling asleep in their long, woolen underwear. During the firing practice Saturday morning, the men were fully in character as they struggled to achieve military precision while performing all of the complicated precursors to firing their guns — pulling a paper cartridge from a leather pouch slung over the shoulder, biting off the top, pouring gunpowder down the rifle barrel, withdrawing a ramrod from a slot on the rifle and using it to pack the gunpowder before returning the ramrod to its place. Smoking an antique pipe, he occasionally fired his own pistol into the air for emphasis while he strode back and forth behind them, sword swinging from his waist. Yet for all their dedication, the illusion was neither broad nor deep. A woman in a peach period dress, standing over a pile of rubber amputated limbs, surreptitiously checked a smartphone; while across the street from the makeshift camp, cars bearing unimpressed passers-by flowed in and out of a McDonald’s parking lot. Nick Bucci, a history buff and creative writing major at the school, said the re-enactments don’t have to be perfect. They have just the right mix of entertainment and education for both participants and onlookers. A considerable amount of thought and detail goes into the re-enactments. Most participants are ongoing members of the 15th Alabama, Company G outfit, a group that was chosen because it once battled a Union force led by Joshua Chamberlain, Maine’s most prominent Civil War hero. Many of the members pretend to be actual individual soldiers from Company G and try to recreate, as accurately as possible, that person’s actions. The battles themselves are recreated on the anniversaries of the dates they actually happened, so that the sequence and relative timing of the skirmishes are accurate. For a soldier who has been active in the re-enactment scene since 2011, a full campaign would include four years of events extending into 2015, 150 years after the war ended in 1865. Once a cycle is complete, a new one is begun. For the women, it is more difficult to identify a specific character to play, because there aren’t many records of the women who traveled to the battlefields with the men, usually providing services such as sewing or cleaning or acting as prostitutes, said Kylah Coffey, an 8-year re-enactor who drove up from Lowell, Mass., with her husband, Dave Laiche. Coffey sat on the ground in period garb, using needle and thread to sew a piece of clothing in the style of the day. Sewing by hand is one skill that she said re-enacting has helped her to refine. “Something always needs repairing,” she said. Coffey said the purpose of the activity is primarily education. Much of the quality time she and her husband spend together revolves around the Civil War scene, whether they are actively preparing for an upcoming event or reminiscing about memorable experiences they’ve shared. While the re-enactment community is generally amiable, she said, heated arguments about the finer points of historical accuracy occasionally do break out, as was the case last year when an event onlooker jeered at a soldier’s purple socks. Tom Basford, of Gardiner, said he has maintained an overgrown set of white whiskers for the past 11 years in the interests of historical accuracy. However, Basford said a new member doesn’t have to maintain any particular level of facial growth to be welcome. The group often lends clothes and artillery to new members, but over time they are expected to accumulate items of their own. A replica gun costs about $800 new, while used ones often can be found for about $500, he said. Buying everything new — a gun, a complete outfit and various supplies — would cost an estimated $1,500, he said. Basford said each re-enactment location must be equipped with firewood, a source of clean water and access to a bathroom or portable toilets.